She was Xena, a mighty princess, forged in the heat of battle. Xena and Gabrielle in happier days (or outcomes). After A FRIEND IN NEED II aired, the fans demonstrated a great love for Xena: Warrior Princess through discussion and disgust bursting into the forums and the websites with messages about the bitter end. I am aware of all the consequences and feelings for this nasty and unforgettable episode, but in this case, I do not want to express my personal feelings for Xena's death and the incoherencies of this final episode. That does not mean that I liked the episode. I hated it as much as anyone else did. However I have been trying to overcome this ordeal by remembering what Xena gave us and the wonderful moments we spent watching Xena. I heard many people saying that they regretted watching Xena for six years because they did not like the end of the series. They found A FRIEND IN NEED such a global reformation of the entire show that it made them think they had wasted their time watching all the previous episodes. However, these people committed a mistake by remembering no more than the depressing culmination, and not paying attention to the fantastic lessons and friends that the show gave us. For that reason, I have pondered many of the wonderful lessons and moments that Xena gave us. I would like you to consider these important lessons, as well. For your convenience and edification, I have put together some essential and meaningful lessons that Xena gave to other fans and me. This way, you can see why and how Xena changed our lives and behavior and why we shall never be the same again. We all know that after six years of watching Xena, we will never be the same again. Xena has had such an influence on me that it has made me do things I did not believe I was able to do. For example, I had gotten so obsessed with Lucy Lawless' extremely white teeth that after watching Xena for the first time, I immediately ran to the bathroom in order to brush my teeth! I brushed my teeth so strongly and so many times that I hurt my palate. Yes, I realize that this is somewhat childish, but this is an example of how Xena has been adapted to many people's lives. Consequently, I now have completely white teeth. Many people admire my teeth. My teeth are me, so they admire me, too. Irrespective of the above lame example, Xena has affected many fans' behaviors and opinions profoundly. Online Xenites are more affected than others are because they have access to the Internet. This makes them more fanatical and involved with the series, because of the instant gratification that the Internet provides. If you are a Xena fan, you cannot deny that you have learned something from Xena. We all have learned something from the Warrior Princess. Take Whoosh!, as a further example. Here you will find different opinions and interviews from and about people from all over the world. These people will never be the same again because of the influence that Xena has had in their lives. One such person is my 17 year-old sister. She was the one who introduced Xena into my life. I am very grateful to her for that. After seeing Xena for three years, she made up her mind to go to a gymnasium. There she learned acrobatics and different self-defense tactics. In the beginning, when she was asked why she had the sudden idea of working out, her response was, "Because I want to keep fit." However, after seeing FRIEND IN NEED II, she started crying and telling her relatives that she really loved Xena. She confessed that she had started going to the fitness center because she had been so obsessed and absorbed with Xena. She wanted to make true a dream she had when she first saw Xena. She cried a lot and she told her family that Xena had changed her life utterly. She could not believe that her teacher was dead. For my sister, Xena was a teacher. Xena had taught her about life. Above all, Xena and Gabrielle gave my sister the strength to tell her family that she was a lesbian. She felt heartbroken by the end of Xena. She showed us her real feelings for the series for the first time that day. I thank Xena for being such a good teacher and for giving my sister the power to come out. I do not want to ever see my sister or anyone in my family go through any unnecessary pain. Xena also helped me to come out. Now I can say openly that I am gay and that is NOT a problem for me anymore. Another good opinion about Xena and this reflective and obsessive subject is the subtext. My friend Peter, who was very rude to the gay community, now is completely different. After seeing Xena for six years, he now respects gay people. He was very unfriendly with to gays, but after seeing the episode THE QUEST, he realized that Xena and Gabrielle were gay and he had to accept that. He learned from Xena that no matter if you are homosexual, bisexual, or heterosexual, you can be a fantastic person as Xena and Gabrielle were. That is, perhaps, the essential lesson of Xena, because Xena changed his way of thinking. Xena made a good person out of him. I am extremely grateful for that. I do not like people who are unfriendly to gays. I asked Ancestrina, an assistant from Xenaverse, what she thought about Xena: Warrior Princess. She replied that she thought of Xena as a teacher, too. She told me that she had always been wishing to be like Xena: a realistic and practical person who did not care what other people said. She had also learned to accept gay people. After seeing several episodes from Season Four, she decided to declare herself as a subtexter. It was very difficult for her to accept that her heroes were gay, but she did it. Furthermore, she no longer thinks anything bad about lesbians and gays. Instead, she approaches them with understanding. Ancestrina replied that Xena was very useful for her because when she started watching Xena, she was growing up. She was an idealistic and na�ve girl, but while she grew up, she saw Xena as an example of responsibility and realism. For that reason, Xena helped her while she was growing up and becoming a woman. She wanted to be like Xena, so she tried to adapt Xena's skills for responsibility and adulthood. Now she thinks very clearly and practically. That is all thanks to Xena. 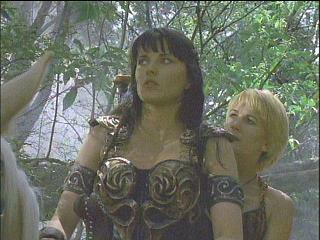 She says that she thanks Xena for being a strong teacher and a perfect role model of life and dependability. Buffy Taborn stated that she thought that Xena changed her way of thinking. She learned to accept her mistakes. Years ago, before seeing Xena, she was a very proud person and she did not accept her mistakes. Yet, throughout the years, after seeing Xena many times, she could overcome that defect. She said that she admired Xena for being such a responsible model, and that is how Buffy is now, a responsible woman who deals with her mistakes. Obviously, her errors were not so terrible and dreadful as Xena's. Now, she sees her mistakes as a lesson for the future and she is a true and honest woman. Samantha O'Connel decided to build a Xena website. She started with a very poor website with a bad and tacky web design. To be honest, her website was the worst on the Internet. However, years went by and she learned about Web design and construction. She improved her abilities. Her site became one of the most wonderful sites out there, and she improved not only the design, but her orthography and grammar as well. How did this happen? She spent hours writing about Xena. She won an award for the best Web design in 1999. Unfortunately, her website has closed, but I will always remember her hard work, dedication, and the love with which she built that great website. Xena was a very important influence on her. She improved her language skills tremendously by her participation in fandom. Greek mythology and Greek culture were other topics that we learned from watching Xena. Many of my friends got interested in Greek mythology after seeing Xena. They began reading books and nosing around anything related to Ancient and Modern Greek culture. They learned history and now they are very erudite, standing out when they speak with history teachers and otherwise ordinary people. Language is an important subject in Xena: Warrior Princess. Xena and the characters speak in clearly understood English. I consider myself part of this group because I have greatly improved my vocabulary and sometimes people feel awkward when I talk to them, for they are not that accustomed to hearing such a diverse vocabulary everyday. For many, Xena is a Utopia. It represents an ideal person, a role model. I consider myself a fan that wants to be like Xena and to have her intelligence. She is very smart and clever and that model impels us to be as intelligent and out of the ordinary as Xena is. Another wonderful thing that we gained with the years of watching Xena, is the strong, close, and beautiful friendship between Xena and Gabrielle. We all have made many friends through the Internet. We have met many people from different parts of the world. We will never forget this great gift. Xena and Gabrielle were living examples of how two people behave when they love each other. That is another lesson that urges us to fight for real love and try to love somebody as intensely and unconditionally as Xena and Gabrielle. What a fantastic lesson for us in real life! I believe that the Warrior Princess has affected all of us in bigger or smaller measure by seeing so much Xena, mainly when sharing our points of views with other Xenites via Internet; our perspective of the world, and ways of thinking change, and all that is because we have something that connects us all and that is what we all must be thankful for. We will never ever be the same again, and all this is because of Xena: Warrior Princess and her deep power over our daily lives. Some people have realized these lessons unconsciously and other people have learned them consciously. I remember myself four years ago, when I saw Xena for the first time, and I know that I am not the same. Xena "made us" different persons and changed our bad attitudes and customs. You know what I mean. Please, remember this article every time you feel sad about the end. I was born in Germany, the fifth son of Amelia Cabrera and Sefton O'Neill. I spent most of my childhood in Britain and studied in the German academy of Art and Literature for six years. When I graduated in languages and German literature, I went to travel around the United States and Europe for two years for my studies. My plans for the future are to graduate in parapsychology and Tarot to go to work at the French school of Parapsychology and Hidden Sciences. Now, I am writing a book called "The Different Cultures and Styles of Europe and the USA," a book for foreign travelers who want to visit the USA or Europe. It will be published in January 2003, and is being translated into six languages; unfortunately English is not one of them. I am 23 years old. I started watching Xena because I am homosexual and I could identify with Xena and Gabrielle, and of course, I am a subtexter. I live with my boyfriend Tom in an apartment in Canada.